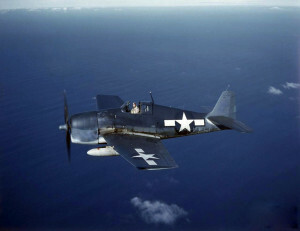 On March 4, 1945, an Ensign piloting an F6F-5 Hellcat, (Bu. No. 77477), taxied into position for takeoff at the Nantucket Naval Air Station. After being granted clearance, he proceeded down the runway. When the aircraft had reached an altitude of about 20 feet, the engine suddenly cut out and lost all power. The plane touched down approximately 100 feet beyond the end of the runway while still traveling at a considerable speed, where it struck a small mound and again left the ground. It then stalled, and fell again, landing on the left wing and flipping over. The pilot suffered a fractured vertebra, and the plane was wrecked, but did not burn. The aircraft had been assigned to VF-92. Source: U. S. Navy crash report, 10-45.